Just like last year, an Ortec Finance Tech Labs team participated at the Blockchaingers Hackathon 2018. Again a very well-organized mind blowing event where 700 pioneers across 63 teams competed with each other within 7 tracks of global challenges. In our track, the future of pensions, nine teams were present. A nice mix between cooperate, student and start-up teams. There are many reasons to build pension administrations and their execution on the blockchain. A blockchain based pension is tamper proof by definition and immune for corruption and mismanagement. Features which are lacking in areas where there is no blind faith in institutions. 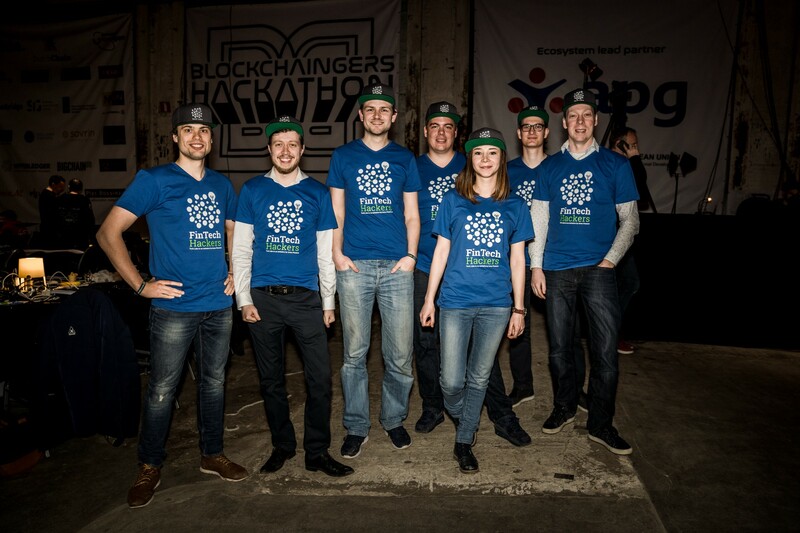 For this hackaton we focussed on creating the missing puzzle piece in the blockchain pension domain: Since the investment risk for such pension contracts typically shift to individuals, these people need help in making smart investment decisions. Nudging is the concept of steering unconscious behavior and has its roots in marketing and sales. The term nudge is derived from the book Nudge: Improving Decisions About Health, Wealth, and Happiness (Thaler & Sunstein, 2008). The typical behavior of Defined Contribution (DC) pension plan consumers is to never change the defaults set by the pension provider regarding the asset allocation. As a result a significant portion of DC contract holders are not getting the most out of their investments. During the 48h challenge we created Dr. Nudge; our solution to nudge the behavior DC pension plan consumers in the right direction. 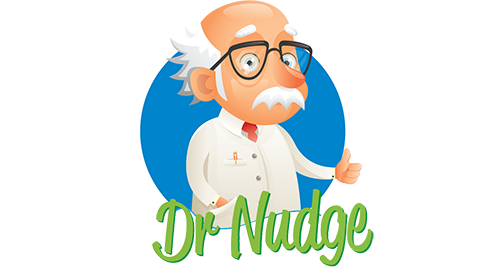 With Dr. Nudge we want to unlock the benefits of Dynamic Asset Allocation Strategies (DAAS) for non-expert users. By providing Dr. Nudge with some personal data alongside a financial goal (e.g. a target wealth or income), the application will optimize (using Ortec Finance Economic Scenario’s) a DAAS which acts on both the time left and the current amount of wealth. In contrast with regular life-cycle products Dr. Nudge will provide the user with a tailored solution. One of the great benefits for this a solution being on the blockchain is that we can implement Dr. Nudge’s results directly into a smart contract, which can interface with digital asset management platforms (e.g. Melonport). The contract is able to receive deposits and reallocate them according to the defined strategy. The smart contract will consider a new near optimal allocation for every rebalance moment which can be set by the user (e.g. daily, monthly or yearly). Hence, with Dr. Nudge one only sets their preferences and goals once, and the execution of a near optimal investment strategy is ensured for the product lifetime. Providing a care free solution which significantly increases the probability of reaching your goal. For example if one wants to invest €10k now (2018) during a period of 40 years (until 2058). His/her goal can be to achieve €60k for additional pension. The figure on the left shows how the target wealth distribution of the investment in 2058. 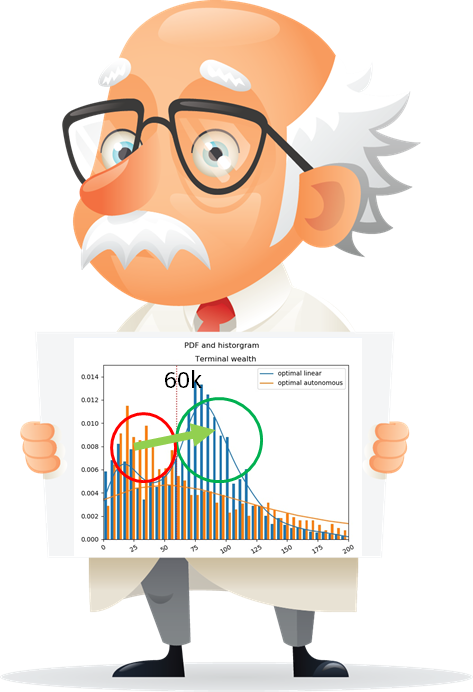 Here we observe that the blue graph (Dr. Nudge’s advice) shows a significant higher probability of reaching €60K than the benchmark strategy (orange). As a trade-off, the blue strategy has less upside potential (>€125k) than the orange strategy. Our method is not only suitable for individual pension savings, but for any other financial goal. The web application we created interacts with an Optimization API (Python running in Docker) and the Ethereum blockchain. We choose to use Blockapps for speed of development, but any implementation (public or private) should be usable. 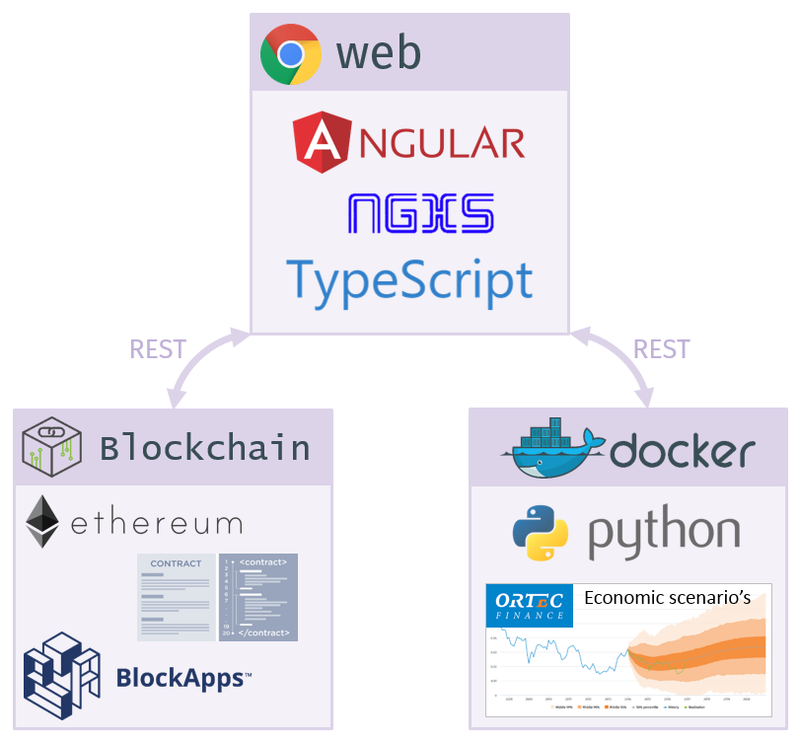 Both these services communicate via REST to the web application. The hackathon result demonstrated above all that, while blockchain technology has the possibility to disrupt large sectors in the financial world, a lot of work still needs to be done to pave the way for a smooth implementation in the current pension system. Through events like the Blockchaingers Hackathon, meetups with blockchain pioneers and our own in-house research and development team, Ortec Finance remains at the forefront of technological innovation in financial decision making.